Entering this NEO Endurance Series season, one storyline was how new teams would assimilate themselves within a field of familiar faces. After the first three races, veteran NEO GT teams had a two-to-one edge over newcomers on the strength of CoRe SimRacing’s wins at Sebring and Interlagos. 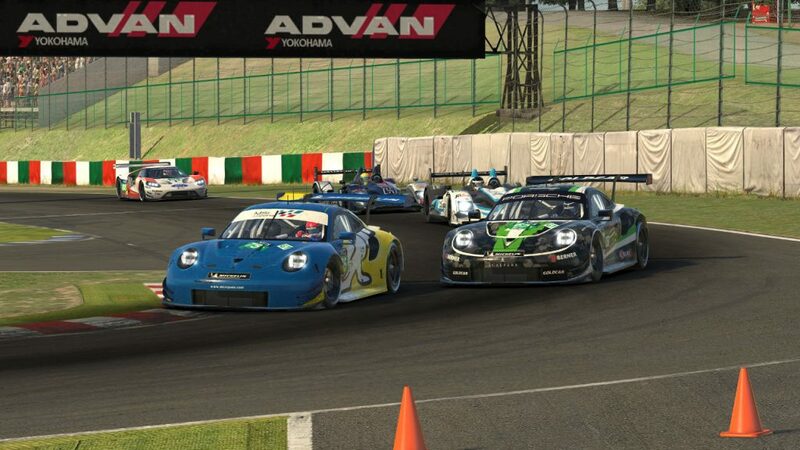 However, entering a Suzuka circuit on which few teams had experienced high-level multiclass competition, this season’s GT rookies hoped their adaptability would allow them to even the score. The battle between experience levels began with an epic qualifying duel. Jürgen Frank from the veteran SimRC.de squad logged a blistering lap of a 1:52.5 that appeared untouchable. Late in the session, though, Simone Maria Marcenò bested him by half a tenth to put Logitech G Altus Esports — the COTA race winner — on the pole position. Marcenò made a clean getaway at the start of the race, but the first lap wasn’t completely clean throughout the rest of the GT field. 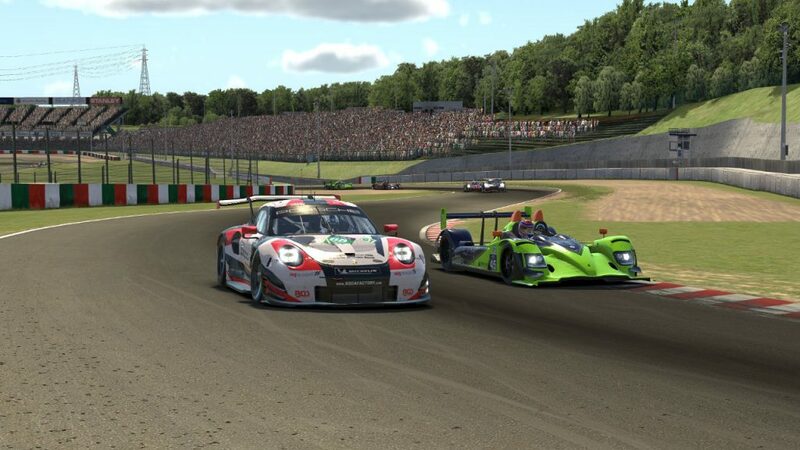 Contact in the esses with Team Buschfink Racing sent the Williams JIM Esports #97 car spinning, while later in the lap, a multi-car incident involving TRITON Racing and the Williams’ #96 team occurred in the Casio Triangle. Altus leads the GT field through the esses at the start of the race. After taking to the grass to avoid that incident, Team Eighty-Four spun while rejoining the track and nosed into the armco at the pit entrance. Their luck got even worse when they were caught up in a crash between prototypes exiting 130R on lap 10. That was one of several instances of contact between prototypes and GT cars during the hectic first two hours of the race. Both Williams cars were later victims in separate incidents, and S2V Racing — formerly the Army Racing Team — saw their top-ten run ruined by a hit from a P1 car. A bit of contact between GT cars also eliminated a few teams, including two contenders with multiple years of NEO experience. After exiting the pits on lap 34, Reinaldo Llerena spun the Thrustmaster Mivano Racing Ford GT in the esses, and SimRC’s Frank couldn’t avoid him, damaging both cars and leading to their eventual retirements. Following that first round of stops, the GT race had a new leader. CoRe skipped a tire change during their stop, moving them from fifth into the lead. Kimmo Suominen led much of the next stint until Marcenò and new second-place runner Salva Talens from Euphoria Drivex Racing got by on lap 58, putting Porsches back in the top two positions. The next pit sequence brought wholesale driver changes, but Altus left Marcenò behind the wheel and he began to stretch a gap over the drivers behind including MSI eSports’ Alejandro Sánchez, who overtook Euphoria’s Juan Segarra for second place. MSI passes Euphoria into the Casio Triangle to take second place. CoRe’s Janne Kiuru also caught up to Segarra, but it was far from a seamless overtake. Segarra saved a tank-slapper exiting 130R and drifted into Kiuru’s path, sending Euphoria’s Porsche into the outside tire barrier but taking surprisingly limited damage. While CoRe’s Ford suffered a warped splitter in the collision, which officials ruled a racing incident, the hopes for their Finnish duo faded further seven laps later. They collided with a stalled car in turn 2, which caved in their right-front suspension and put the pre-race points leaders out of a race for the first time this season. 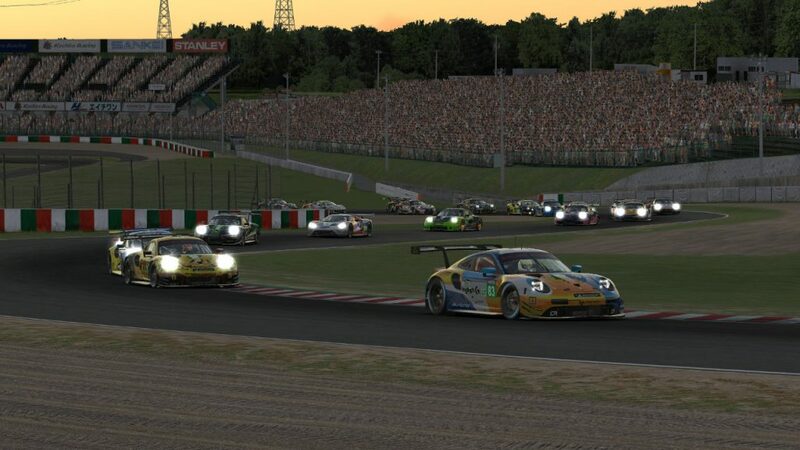 After that mid-race madness, the racing at the front of the GT field calmed down, with the top positions largely settled as the race entered the final two hours. 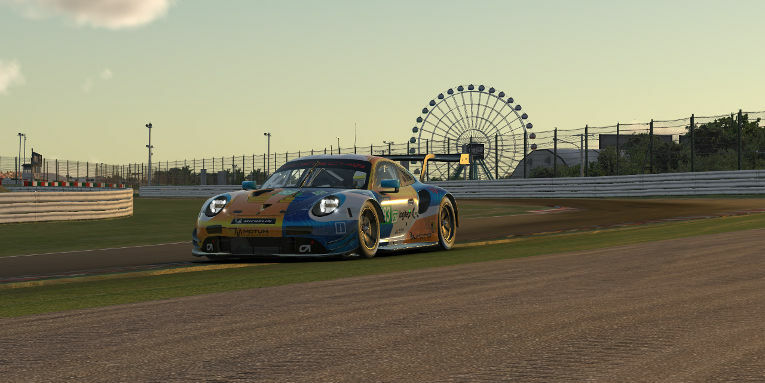 Marcenò eventually handed off to teammate and recent Porsche SimRacing Summit participant Andrew Kahl to bring the Altus Porsche to the finish. Despite a spin in Spoon that briefly narrowed the gap behind to just six seconds, Kahl pulled away in the final laps to earn a dominant second win of the season for the rookie team. Kahl crosses the line to win for Altus. MSI’s pairing of Sánchez and Marc Perez continued to impress in their team’s debut season, earning a second-place result and taking over the championship lead on the strength of their third consecutive podium. Talens brought Euphoria’s Porsche, which still bore the battle scars from their contact with CoRe, home in third to secure that team’s first ever NEO podium and move them into a tie for sixth in points. The Williams #97 team managed a strong recovery from their two first-hour incidents to finish fourth, earning not only their best finish of the season but also their first points of the season. Also taking home their first points were the Odox Motorsport team of Ricardo Ferreira and Cristian Manzano, who had a quiet but consistent and penalty-free race en route to fifth place at the checkered flag. Team Eighty-Five climbed from last on the grid to finish sixth, and Porsche Basel by Sorg Rennsport eSports continued its trend of improving results each race with a seventh-place finish. Sorg’s Philipp Südbeck fights traffic in the esses. For the second straight race, SRN Motorsports finished eighth after surviving a chaotic start deep in the GT field and taking advantage of attrition ahead of them. They held off a late challenge by ninth-place ZENNITH eSport, while Team Eighty-Four overcame its testy first ten laps to end up in the top ten. TRITON held on to second in points after a difficult Suzuka race that included the first-lap incident at the chicane and a later penalty for an unsafe rejoin. Their lineup of Piotr Jagodzinski and Wiktor Smolarczyk finished eleventh. A promising ninth-place qualifying run for Redface Racing was erased by a first-hour solo spin in 130R, which damaged their Ferrari and left them to limp home in twelfth. Likewise, S2V Racing had to bring their banged-up Porsche to the finish in thirteenth as the last GT car running at the six-hour mark. Torrent Motorsports had an early crash exiting Spoon Curve that destroyed the front of their Porsche, and after running most of the race at the back, they retired with just over one hour remaining. They were the highest-placed of eight cars that failed to finish, which also included CoRe and the Williams #96 team following their mid-race retirements. Torque Freak Racing was eliminated when they came together with the Wyvern Racing P1 car on lap 64, and Buschfink was the victim of contact with the P2-polesitting Team Heusinkveld HPD that damaged their rear wing and eventually ended their race. Mivano and SimRC crash together at the Dunlop Curve. 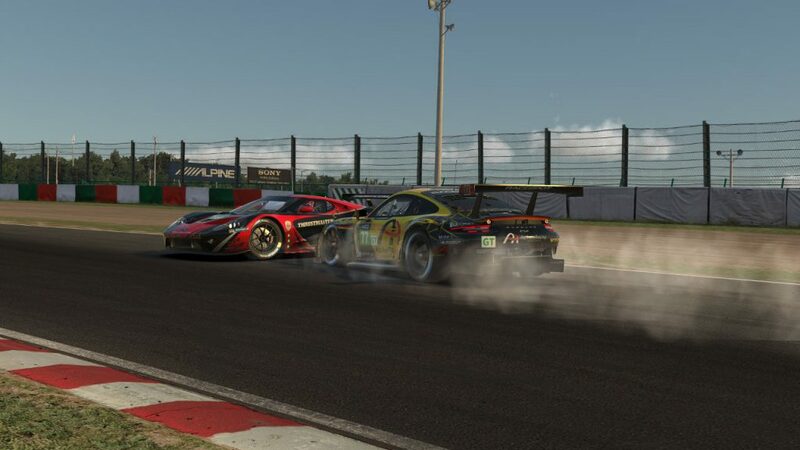 Mivano and SimRC were also DNFs due to their incident together, and SimatoK eSport was the first car out when they pulled their Ferrari into the pits just over an hour into the race. After four rounds of racing, the score is now tied: two wins apiece for the veterans — both by CoRe — and for the upstarts from Altus. Neither team has been invincible this season, though, with each retiring from one race and finishing outside the top ten in another. As a result, it’s not the most decorated teams leading the class standings, but two of the most consistent: MSI and TRITON. While those teams set their sights on what’s to come at Spa and Le Mans, the rest of the GT field is likely breathing a sigh of relief, and perhaps frustration, following the tricky and traffic-filled recent rounds. 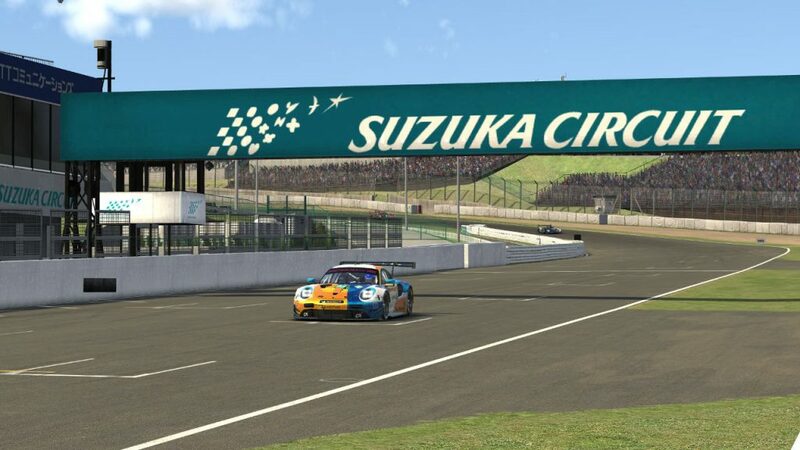 Indeed, with two-fifths of the field failing to make the checkered flag, it’s safe to say that some teams will be glad to say sayonara to Suzuka.